I want to send a video email so I have to compress it. It gives me smaller size, but also lower quality. I wonder what is the best software to reduce file size on Mac fast and small but still with good quality images? To compress files on Mac to smaller size is a great way to save storage, and a required option to send emails. But how to compress zip files on Mac without losing quality is a little bit tricky. Therefore, here we share you the best file size reducer for Mac (MacBook Air/Pro, iMac) that can compress files size on Mac with password, without losing quality, including videos, pdf, jpeg, photos etc. Videos, especially those in HD or UHD will can easily be gigabytes in size, making it hard to upload or download, being able to be sent by emails or transferred to mobiles and will occupy much space and make your computer even slower. That's where video file compression software for Mac comes in. In order to compress video file size on Mac fast and small with no quality loss, the Mac file size reducer MacX Video Converter Pro is highly recommended. This video file compressor for Mac OS X can easily reduce video file size and compress MP4 MOV MKV AVI WMV, 4K Ultra HD video to smaller-sized FLV or WMV or using its advanced video editing and settings adjustment feature to shrink video size without video conversion. The High Quality Engine will guarantee a video file size compression on Mac without losing quality, and the Intel QSV/Nvidia/AMD hardware acceleration tech will dramatically speed up the video compression speed, 5 mins to compress a 5-9 GB MP4 video file, 5X faster than handbrake and other rivals. 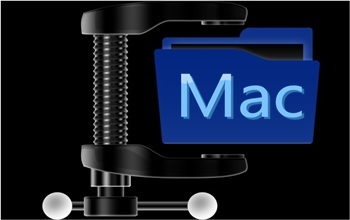 Step 1: Free download this Mac file size reducer on MacBook or iMac, if you need to work on PC, get the windows version. Click "Add File" to load the video files to be compressed. 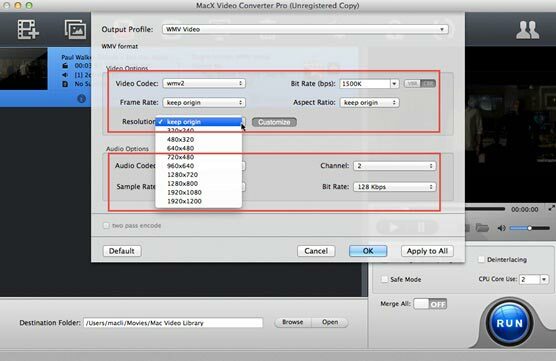 Step 2: To compress zip files on Mac without losing quality, you can either convert and compress MP4 videos to FLV, WMV with smaller size, or shrink file size on Mac by adjust the bitrate, resolution, video codec, sampling rate etc, cut the unnecessary parts or split the video into shorter pieces etc. Step 3: Set the destination to save the compressed video files on Mac computer. Step 4: Click "RUN" button to start the video file size compression on Mac with the aid of the best video compressor for Mac. No quality loss. PDF is a popular format to save the text, photos, images and graphics and other elements, and also allow encrypted password protection of the files. But PDF can easily be large in size, making it impossible to be sent by emails, open or downloaded. 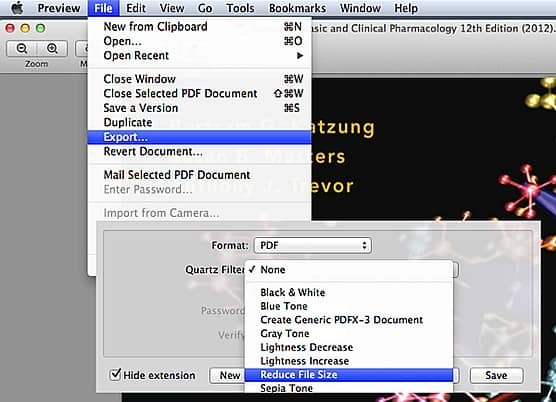 How to shrink a pdf file on Mac (MacBook Air/Pro, iMac)? Normal PDF file compression software for Mac will result in blurry image and lower the quality. Rather than relying on various Mac file size compressor for PDF, Mac users can use Preview to compress zip files on Mac. Step 1: With Preview, you don't need to install a third-party PDF file size zipper for Mac (MacBook, iMac). Launch Preview on Mac and click "File" and open the PDF file that you want to compress. Step 2: Click "File" button and choose "Save As", rename the reduced PDF and specify a location to save it. Step 3: Select "Reduce File Size" option from the pull-down menu next to "Quartz Filter". Step 4: Click "Save" to start the PDF file size compression on Mac OS X. The new PDF file will be will be smaller in size without quality loss. Note: if you want to compress files on Mac with password, or further compress pdf into smaller size, you are suggested to try those professional PDF file compressor for Mac such as PdfCompress, PDF Squeezer, PDF Shrink etc. Also see: online file size reducer, mov file shrinker. Sometimes you may want to share a song with friends or families by emails only to find that the file is too large in size. Music files like MP3, AAC are often compressed, but you may also compress zip files on Mac without effecting the quality if the music is too large or in uncompressed formats like .wav or .aiff. Here the Mac file size reducer for Music we select is Audacity. This is a free, open-source audio zip program for Mac, Windows, and Linux. It can easily compress music files on Mac in WAV, AIFF, MP3, and OGG files into smaller size without quality loss, while allowing users to edit the music files with cut, copy, and paste features, mix tracks, or apply effects etc. 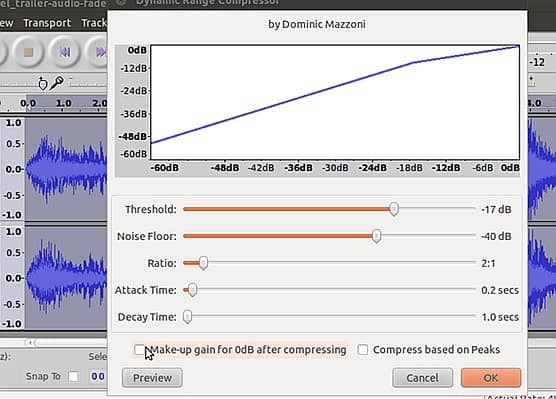 Step 1: Free download the mp3 audio file compressor for Mac (MacBook, iMac). Click Edit > Open and select the music file to compress. Step 2: Click Project Rate and choose a lower value. Step 3: Click the drop down arrow next to audio file and select Split Stereo Track > Mono to reduce music files to significant smaller size. Step 4: Select flat parts on the waveform and hit the delete key to remove silences on the file. Step 5: Click Edit, Select and All. Step 6: Click Effects, Change Tempo and move slider to the right. Increasing tempo lowers the size of the file. Click Preview to check and OK if satisfied. Step 7: Click File > Export and choose a compressed audio format and it will start to compress files on mac. To enable the pictures load faster, or send photos by email to friends, people usually need to compress images and photos. Obviously, some Mac file compressors for images tend to reduce the images to smaller size by sacrificing the image quality. 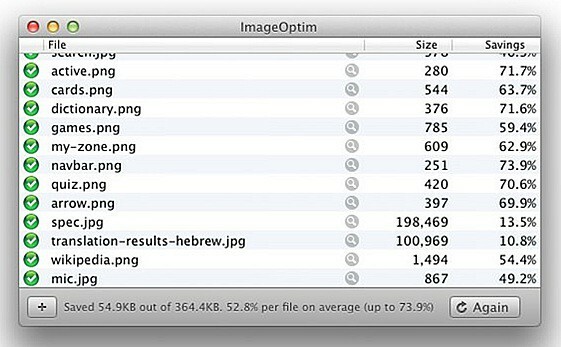 To reduce images (JPEG, PNG, JPG, GIF) size without losing quality, here comes ImageOptim. Step 1: Free download the image file resizer for Mac OS X. Drag images onto its window or Dock icon, or click on the plus (+) button to select images. Step 2: The Mac file compressor will start to shrink the png, jpeg, gif image size on Mac OS X using a slew of tools. And it will list the compressed output image size of each tool. Tips and tricks for Mac users: you can also compress video files with iMovie and zip and resize files with Mac Finder easily and quickly.